Anyone who's watched a bird feeder long enough will note that birds don't always take their turn at the trough. Birds can agressively defend a perch or drive other birds off. 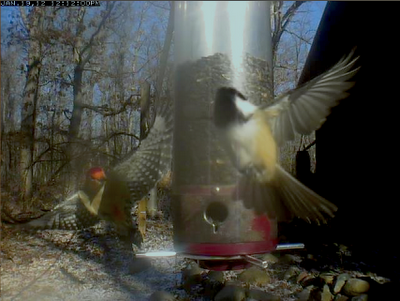 I posted this photo to my twitter stream just the other day of a Red-bellied Woodpecker chasing a Black-capped Chickadee off the feeders at work. The image was captured with our automated feeder camera. Liset Karmen and Cees Keyer in the Netherlands captured this video of European House Sparrows fighting over perches on a feeder. Even better, they captured it on a high speed camera so we can watch the action in slow motion.